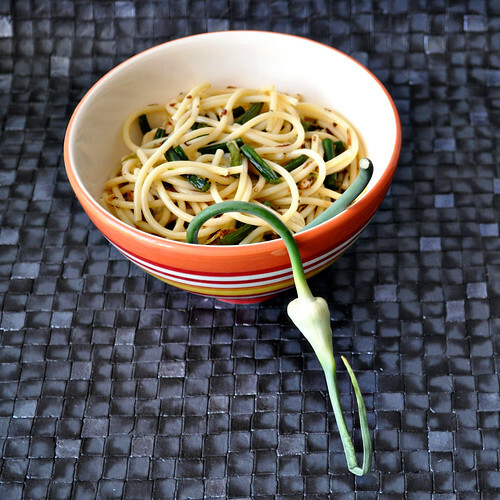 I had only heard of garlic scapes before I saw them a few weeks ago at my farmers market. There were just two lonely basketfulls left and they were cheap, so I ran up, despite already buying way more then I had intended to, and scooped them up. I had no clue what the heck to do with them, I'd only remembered seeing recipes for pickled scapes before. 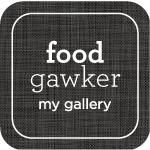 My recent pickling experiment resulted in beautiful jars of entirely inedible beets, so I was weary of trying anything with vinegar anytime soon, so I searched the web until I found a recipe I felt safe with. But then what part do you use? 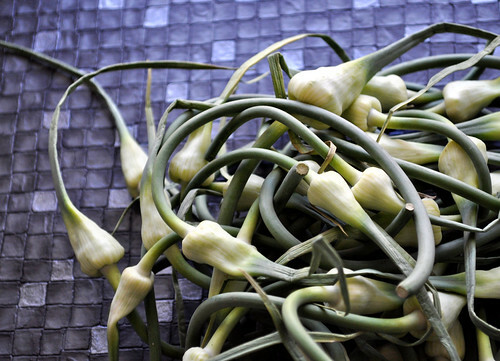 Garlic scapes are essentially wild baby garlic. The bulb is just beginning to form and the green stem has a lovely floral and mild garlicky flavor. The bulbs on mine were quite a bit fuller then the ones I saw in pictures, and most recipes said to just use the stem, but when I peeled open the bulbs I saw these beautiful baby garlic bundles, so I peeled off the top skin and chopped up the bulbs too. 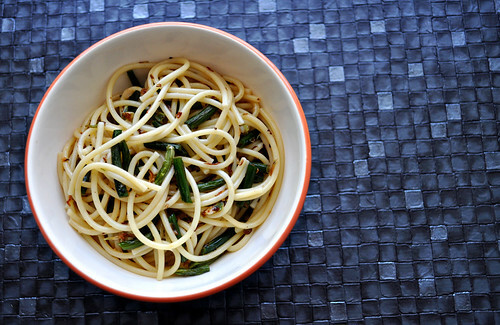 The recipe I had settled on was for a very simple pasta dish from from Food Republik that would allow the scapes to shine, backed by tender spaghetti and brightened by a touch of lemon. I topped it with a light shower of Parmesan and ground black pepper and called it dinner. On a slightly different topic, I have a request for you guys. It turns out that I'm seriously behind on my pop culture. There are a ton of movies that people talk about on a daily basis that I'm absolutely clueless about. In this stifling heat, I rarely feel like venturing out of my air conditioned home, so I signed up for Netflix (before their incredibly greedy price hike announcement, which is a rant for another day) and I'm slowly trying to catch up, but aside from a few things I know I wanted to see, I'm at a loss of where to start. So if you found your way here, please drop me a line and let me know what are your favorite movies, and books for that matter as I'm always looking for great recommendations. Thanks! Cook the pasta as you normally would until it's al dente. Drain and reserve a cup of the pasta water. Heat the olive oil in a skillet over medium-high heat. Add the chopped garlic scape stems and stir fry about 3-4 minutes until they're almost tender. Add minced garlic and minced scape bulbs and the butter and stir fry another 2 minutes until the minced parts are lightly golden. Stir right into the drained pasta, add lemon juice, some salt and a hearty shower of freshly ground pepper. Add a bit of the reserved pasta water if pasta is dry. Taste for seasoning and adjust if desired. Top with shaved Parmesan and serve immediately. It also reheats beautifully making for some very tasty leftovers. 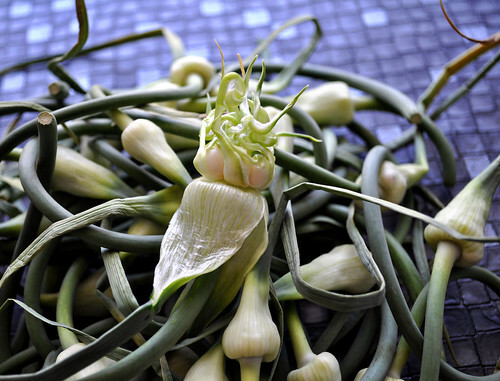 UPDATE: It was pointed out to me that I may have misspoken about what exactly a scape is, so I went to wiki and I pulled out this wonderful quote: "The [garlic] plant often forms strange curling stalks, or 'scapes', with odd nodules called umbels. These rococo growths contain their own minicloves called bulbils, a term that sounds like a playground insult." So I guess garlic is really the root and scapes are what grows out of the ground...and generates something that looks almost exactly like the root yet again. What a complicated creature! I love how all the ingredients can be easily found in the fridge ;) This is a simple pasta but it's so gorgeous and perfect for the warmer months! Simple pasta with lemon, garlic and cheese -- it does not get better than that. Love this dish. You already watch the same show I watch but you could always start watching so you think you could dance. I've never cooked with garlic scapes, embarrassingly! This looks so delicious! 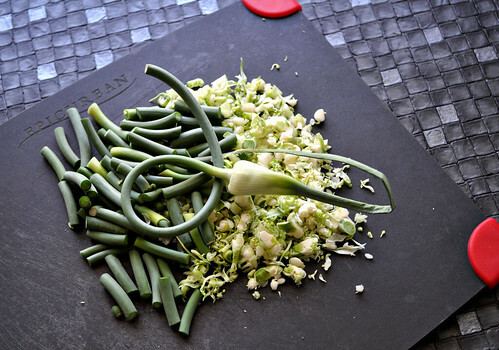 Your recipe sounds delicious but I must correct you, garlic scapes are actually the flower that forms from hard neck garlic. It is usually pulled so that all of the plants energy will go into the bulb and not into the flower. I myself learned about scapes when I first began to grow garlic 3 years ago, there is always a learning curve, that's the fun of it! Keep on experimenting!